Millions of Americans suffer from ongoing back pain, and many millions more live with frequent or reoccurring back pain. It’s the leading cause of disability in people younger than 45, and many things can cause it. When it comes to taking care of your back and protecting yourself against back pain, it is important to understand the causes of back pain. This makes it easier to avoid them and minimize damage when they do occur. There is a layer of soft tissue between each vertebra that acts like a tiny shock absorber for your spine. If the disc is slipped, it means it has slipped out of alignment while a herniated disc is one that has ruptured and deflated in a way. It’s usually caused by wear and tear and associated with improper lifting, bending, and twisting. Both these conditions cause the bones of the spine to rub together. This causes pain, wear and tear, pinched nerves, and damages surrounding tissue and muscles. This condition is diagnosed when the discs in the spine protrude, or “bulge,” but not as much as with a herniated disc. Bulging discs are a warning sign that you may end up with a herniated or slipped disc soon, though. Most people don’t feel minor bugling discs until they progress to a point where they start hitting nerves and compressing the spinal cord. The problem is there is often very little warning between a bulging disc and a full-blown herniated or slipped disc. This is why spinal care and routine checks help identify common causes of back pain. The discs of your spine work as shock absorbers and help protect your vertebrae and the spinal cord from damage. With this condition, these spongey pads of soft tissue begin to deteriorate, shrink, compress, or tear. 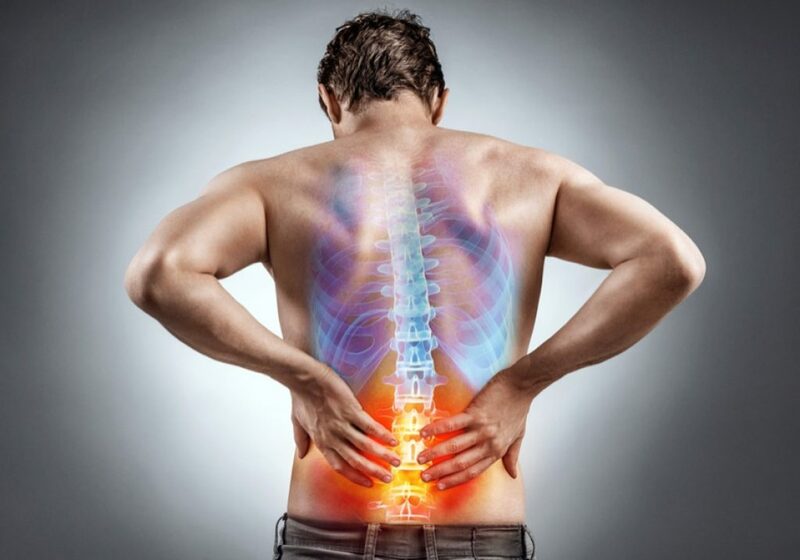 That causes the bones to rub together and results in pain, stiffness, clicking of the spine, and other painful conditions that affect everything from walking to bending to sitting. This disease most often occurs in the senior years but it can occur in younger individuals if pre-existing conditions or injuries have damaged the spine. This joint lies within the spinal column and is located where your spine and pelvis come together. Even though it is technically a joint, it does not move much compared to other joints in the body. However, it is an important part of your spine because it transfers the weight of your upper body to the lower body. Swelling and wear and tear in this joint can lead to pain in the lower back as well as pain, numbness, and tingling that radiates to your hips, thighs, and down your legs. It is one of the lesser known causes of back pain, and it typically strikes without warning. This condition is one of the leading causes of back pain. Those who suffer from it have a spinal canal that has narrowed abnormally. This area is where the nerves of the spinal cord run, and when the areas get too narrow, the nerves of the spinal cord can be compressed and pinched. That adds pressure on your spine and nerves and results in pain in numbness from that point onward. It is like crimping a garden hose and reducing the flow of water; it reduces the nerve flow and affects the central nervous system. This is a fancy medical term for one of the most common causes of back pain: a pinched nerve. It’s usually caused by a bone spur or a herniated disc. They can be a constant issue for some people and cause pain on a regular basis. Others may have a pinched nerve but experience pain only during bad flare-ups. These flare-ups usually follow abnormal use or strenuous activity that put unusually or excessive pressure on the back. Pinched nerves can happen to anyone at any age. There are a number of outside forces and factors that can lead to back pain. Even extremely healthy individuals who take care of their backs each and every day can suffer from back pain caused by accidents or injury. Car accidents, falls, muscle sprains, strains, and fractures are all common causes of back pain. Here are some instances that lead to back pain that may need to be addressed by a healthcare professional like those at our pain management centers in Chicago. The spine is built to stand up to a lot of wear and tear. But it is not invincible, and like any bone of the body, it can break or get fractured in a severe accident. A break to your spine can be caused by a hit to the back, a fall from a high height, some kind of impact, or if you have osteoporosis. Injuries can easily occur to the various ligaments, muscles, and tendons that provide the spine with its strength and support. This often happens when you lift something and twist at the same time or as a result of a sporting or auto accident. Pain is almost always associated with this kind of injury. Most people who make it into their adult years will experience back spasms at least once. You can get these painful cramping spasms when muscles and tendons get torn, stretched, bruised, or otherwise injured. They usually happen as a result of lifting heavy items or playing high impact sports. Sometimes back pain can be caused by simply doing too much without taking a break or taking proper care of your spine. Your muscles will get tired, and if you push too hard for too long, your back muscles will eventually give out, and pain, weakness, stiffness, and numbness can be the result. It is important not to underestimate the power of feelings and the effect our emotions can have on our bodies. Stress can lead to muscle tension, and depression and anxiety may make the pain feel even worse. Being blue also makes it hard to do things to keep us healthy and fit which makes things worse. A processive degenerative disease that causes stiffness, swelling, and inflammation in the joints and bones of the spine. This type of arthritis is one of the causes of back pain and occurs when the joints and discs in the spin break down and bone rubs against bone. This is a type of arthritis that affects your joints and ligaments along the spine and can result in nerve damage and pain. A form of arthritis that originated with the immune system mistaking healthy cells and tissue for intruders and attacks itself. This condition is almost always present at birth and pain most commonly starts to set in during mid to late life. The weight that is normally gained during pregnancy can stress the back and cause back pain during and immediately after the pregnancy. In some cases, cancerous tumors can form in the spine and in even rarer cases non-cancerous masses may form in the spinal column as well and cause pain. Depending on the causes of back pain that you are experiencing, your treatment could include lifestyle changes, medication, or possibly surgery. Talk to your doctor if your back isn’t feeling right. The medical care team at a pain management clinic will be able to help you discover what’s causing the pain and help you find a back pain treatment plan that works. To learn more about these and other common causes of back pain, contact the team at the Pain Relief Institute today and schedule a free consultation. Get back pain relief and stop living life in pain. Learn to identify the causes of back pain in your life and what you can do to minimize their impact and how to avoid them. Call our pain management centers in Chicago now to schedule your free consultation appointment!